Rhodiola rosea, commonly known as rose root, golden root, or Aaron’s rod, is a natural adaptogen and nootropic substance mainly used to boost the mental concentration, improve the mood, alleviate stress, and reduce fatigue. This plant could usually be found in high mountain areas where regions are cold, including the mountains of Central Asia, the Arctic, eastern part of North America, from Baffin Island in Canada all the way to the mountains of North Carolina in the USA. The supplements made from this herb are mostly known for its healing properties, that is the reason why many people choose Rhodiola rosea for their daily intake. By being an adaptogen herb, Rhodiola rosea preserves the body and its function by healing the cells especially the neurons, by eliminating depression and stress, which improves mood. Local people from Scandinavia and Siberia have been using this herb in order to cope with the cold and ruthless weather conditions. The traditional Chinese medicine recognizes this plant as a part of their common diet, especially in their salads. 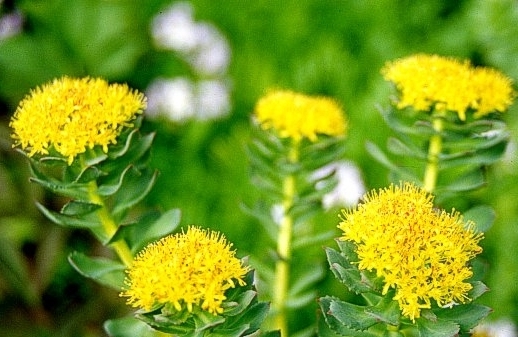 Scientific studies have shown that Rhodiola rosea consists of more than 140 chemical substances, including Rosavin, organic acids, Phenolic compounds, Alkaloids and Flavonoids. Along with other adaptogens and nootropic herbs, Rhodiola rosea is a part of a herbal nootropic combination or stack, having the same potential or as an alternative to the much widely used Adderall. Probably the most notable and important mechanism of action for this herb is the stimulation of the enzyme class called AMPK. Higher concentrations for this enzyme class builds up a number of Mitochondria within the cells. As it is known, Mitochondria represents as the energy factories of our cells, delivering the energy needed for metabolic reactions and processes in our body. The more Mitochondria we have, the more energy in our cells, enabling full efficiency under any given circumstances. As the number of Mitochondria grows in our cells, the fat burns much quicker, including the Glucose uptake in the muscle cells and in the brain. Various metabolic reactions need energy from Glucose, therefore delivering such substances to all parts of our body is vital. One of the numerous compounds of Rhodiola rosea is Salidroside, responsible for inducing muscle cells for Glucose uptake. By imitating the effects of Insulin, Salidroside additionally boosts Insulin and increases the enzyme class AMPK, creating more energy for the cell functions. Along with the mentioned mechanisms of action, this natural nootropic adaptogen has several mechanisms of the usual nootropic benefits. It increases Dopamine and Serotonin levels in the brain tissues, additionally preventing the tissues’ breakdown. The extract of this herb is an MAO inhibitor, slowing down the metabolism of the neurotransmitters Dopamine and Serotonin. On the other hand, it influences one of the Opiod peptides, called Beta-endorphin, which leads to the feeling of well-being and pleasure. One of the nootropic effects which puts Rhodiola rosea as a highly adaptogen herb is its anti-fatigue effect, which increases overall mental performance. It boosts focus and concentration, in both the healthy and those who have a certain type of cognitive decline. As mentioned, this plant helps in the treatment of mild to slightly moderate depression states, without the bad side effects. Numerous studies have demonstrated the extract form’s positive effect on the general skin condition, especially on fading and sensitive skin. Some animal studies have suggested that the mechanism of action linked to Norepinephrine release is essential for Rhodiola rosea’s mental benefits. This neurotransmitter, responsible for alertness and attention, intensifies the body’s energy, focus, and motivation, benefiting the complete nootropic effect. Higher levels combat the aging effects as well, preventing senile Dementia. Because it restores the human body’s balance, this herb is considered to be an adaptogen plant. It is completely safe for consumption, which is shown in traditional Chinese medicine. It normalizes the body with numerous physiological benefits and effects which rejuvenate the individual’s health. Adaptogenic efficiency minimizes harmful effects of fatigue and stress, and restores the functions of the immune system, including the overall cellular health. It fights stress in the manner of lowering the cell oxidative processes, which could lead to a significant number of conditions and illnesses, including cancer. In addition, this adaptogen is frequently used in depression and anxiety treatments. By affecting the levels of neurotransmitters such as Dopamine and Serotonin, Rhodiola rosea boosts the positive mood of an individual. This adaptogen is considered to be safe, as one of the accepted supplements in both traditional and modern medicine. Yet, certain recommended doses should be respected in order to avoid the side effects and to achieve the maximal cognitive effects needed by individuals on nootropic therapy. The typical recommended daily dosage is somewhere between 100 and 600 mg. Special caution is needed when using this supplement, because it is considered to be a mild stimulant. The consumer should start with a lesser dose and then advance gradually. This will adapt the body to a new supplement and avoid the negative tolerance effect. If we take into consideration that each body is unique, then it is advisable to start with the minimal recommended dosage and increase slowly the dosage, which primarily benefits the body the most. This adaptogen nootropic is considered to be mainly safe, yet some side effects are possible, so each user should be cautious when using this supplement. The side effects are mild and could be manifested as agitation, nausea, anxiety, restlessness, hypersalivation, and insomnia. All of these side effects are common from plants and substances that produce stimulatory effects. Most of these side effects were only experienced in cases where a higher dosage was taken. Therefore, a consultation with a medical professional is a must before an individual decides to start a nootropic treatment with this natural adaptogen.